I was born in Mexico, grew up in Tijuana, and moved to Arizona when I was 14. I went to high school in a small town called Holbrook, then went to Phoenix to go to Arizona State University. By that time, roughly 2012, Joe Arpaio's vicious anti-Hispanic tactics had already raised racial tensions in Maricopa County, where he was sheriff. At the time, Arpaio was infamous among my community for his “sweeps.” He would send police into restaurants, hotels or anywhere else he suspected undocumented people might be working and would arrest those who couldn't produce IDs. People lived in fear of these sweeps; some families I knew even moved to New Mexico, hoping to escape Arpaio. I heard all about Arpaio's crusades firsthand. By 2014, I was working as a court interpreter for Maricopa County. Every day, I would interpret for Spanish-speaking people who had been arrested by Arpaio in the desert, trying to come to the United States to work. Arpaio's men would arrest them and put them in detention facilities for months, holding them until they took a plea agreement – so he could get a conviction for them on the record. That way, if they ever tried to return to the United States, they would be placed in federal prison. That same year, I got into a bad relationship and I drove while drunk. I was arrested, and it took the county an entire year to prosecute me. I thought it was the worst year of my life, until I was convicted and sent to one of Arpaio's jails. The minute I turned myself in to go to jail, they took me to the Fourth Avenue jail, the county's hub for all arrests. There, they put me through something called “the Matrix”: being moved from one cell to another for about 12 continuous hours. It was extremely cold, and all I was allowed to wear underneath the striped uniform I was given was underwear and flip-flops. Guards threw me a bag with old bread, an orange and milk; nothing else was offered, and sleeping was nearly impossible. I laid for hours on cold concrete, only to be hustled abruptly to another cell, and then another. Finally, they put me in chains and moved me to another jail by bus. I arrived at one of Arpaio's several “tent cities,” outdoor jails where inmates shelter in army tents, mostly exposed to the Arizona elements. I was there on a work furlough program, meaning that I was allowed to leave to work during the day. Every day after work, I would return to the jail and spend the night in the tents. Each Sunday was spent entirely in the jail. The rules of the tent city were strict, arbitrary and brutally enforced. There were no newspapers allowed; Arpaio hated newspapers. The only food allowed for those of us in the work furlough program was the food in the vending machines, which was grossly overpriced. During the sweltering summer, the temperature could reach 115 or 120 degrees. I was in the tents when we hit 120. It was impossible to stay cool in the oppressive heat. Everyone would strip down to their underwear. There was no cold water, only water from vending machines; and eventually, the machines would run out. People would faint; some had heat stroke. That summer, ambulances came about three times. One man died in his bed. But the winter was even worse. During the winter, there were no heaters. Most jackets and heavily insulated pants weren't allowed; they don't want you to be comfortable. Still, it was freezing, achingly cold. I was in so much pain that winter that now, when I'm cold, it reminds me of being there. It's hard to recall memories of that year. 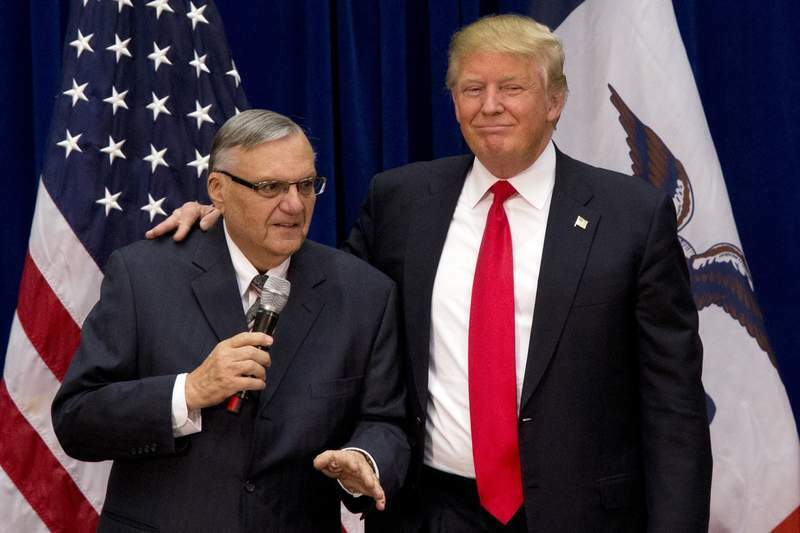 When I heard Friday that President Donald Trump had decided to pardon Arpaio, I was disgusted, dispirited and disappointed in the American political system. The people of Maricopa County have done so much – spent time, money and energy – trying to let the world know what Arpaio had done. And in a single moment, Trump has destroyed all of that hard work, all of those voices. The president should be bringing us together, especially in the wake of something like Charlottesville, but I think that Trump wants us to be divided, specifically by race. Arpaio's pardon is proof of that. Francisco Chairez lives in Arizona. He wrote this for The Washington Post.